Common law separation lawyers can help you navigate the legal consequences of ending your relationship. Davidson Fraese has helped hundreds of people through this process. This article talks about some of the key issues that may arise, but for a free consult call (604) 670-5626 or contact us online. Our experienced Vancouver lawyers can help you start your new life. In Canada, the laws governing unmarried relationships vary from province to province. In B.C., there is no such thing as a “common law” marriage. Instead, the Family Law Act specifically defines the rights and obligations of people living in a marriage-like relationship. A “spouse” under the Family Law Act has all the rights and obligations of a married person! 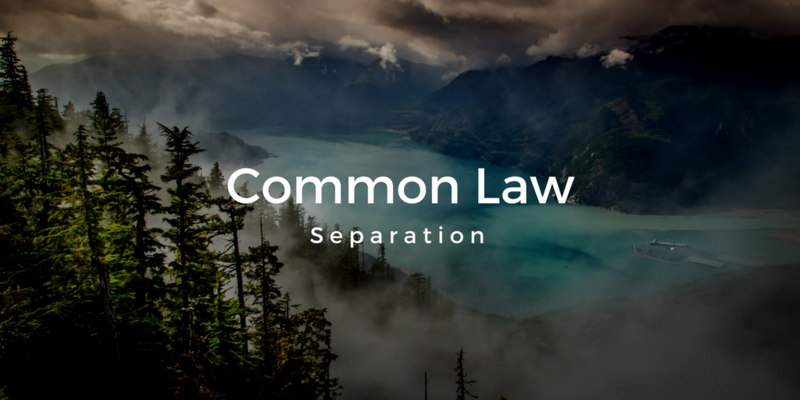 This means that although separating common-law couples do not need a legal divorce, a common-law separation can be just as complicated and painful as a divorce, and may involve many of the same issues. The separating couple must decide how to divide their property, whether support should be paid, and generally how to deal with the consequences of ending the relationship. If there are children, parenting arrangements will also need to be decided. A lawyer can help navigate this process and, hopefully, resolve any issues out of court. What is a common law relationship under B.C. law? who has a child with someone else but has not been living in a marriage like relationship for at least two years. A spouse (whether common-law or married) has specific legal rights to share in the division of property at the end of the relationship, and may also have a right to spousal support. Depending on your situation, it can be difficult to figure out how your relationship would be classified legally. A family lawyer can help you determine whether you have spousal rights under the Family Law Act. How is property divided in a B.C. common law relationship? If you are a “spouse” as defined under the Family Law Act, whether married or common-law, you have a right to share equally in any property acquired during the relationship. However, property that was acquired prior to the relationship may be exempt. Determining what property must be divided and what property is exempt can be a source of disagreement, particularly where a family business or high net-worth estates are involved. In some circumstances, one spouse may be entitled to an unequal division of shared property in their favour. However, in the vast majority of cases each spouse gets half the matrimonial property. Although the law is simple, the facts can be quite complicated. Negotiating the division of matrimonial property is a major part of family law practice, and an experienced family lawyer can help separating couples move forward on a fair basis. Note that for relationships under two years, where the parties are not married, the sections of the Family Law Act relating to the division of property do not apply. In other words, if you are a “spouse” under the Act because you have a child together, the parenting provisions of the Act apply, and the Federal child support laws apply, but there will normally not be a division of property or debt. However, every situation is different and common law claims to shared property may still arise, even though the Family Law Act provisions does not apply. Is Support Payable after a Common-Law Relationship Ends? If a separating common law couple qualifies under the Family Law Act, either person may seek an order for spousal support or an order that a stepparent pay child support. The same rules apply to an unmarried spouse’s support claims as to the claim of a married spouse. Spouses are treated the same whether they are married or unmarried. Where an unmarried couple has children, each spouse has the same parental rights as a married couple in respect of the children. The laws used to decide who should be a guardian of a child, parenting arrangements, and access to the children are the same for all parents. Getting married does not change the legal status of a parent or improve the standing of an unmarried parent. The process for getting a divorce is clearly defined under Canadian law. By contrast, it can be unclear what is required to end a common-law relationship. However, many of the basic steps are the same. For example, legal separation occurs when either spouse indicates that they are ending the relationship, whether or not that involves moving out of the matrimonial home. Just as with a married couple, separating unmarried spouses may try to resolve their disputes through negotiation, mediation, or through the Courts. While many separating people successfully negotiate for themselves, a family lawyer can help at any stage of the process by explaining how the law would apply to the specific circumstances at issue, and attempting to negotiate a resolution. Where all else fails, the Courts will decide legal claims under the Family Law Act. Court processes typically begin by filing a Statement of Claim setting out what the claimant is seeking. The other party may then file a Statement of Defence setting out their response. While there are many steps involved in Court proceedings, if the dispute cannot be resolved then a trial will be conducted following which a judge will issue a decision. Although significant steps have been taken in recent years to simplify these processes for family law litigants who cannot afford a lawyer, most people working through a family law dispute in the Vancouver, B.C. court system will find it necessary to hire a Vancouver lawyer at some stage of the process. Do you need a lawyer for common law separation? The end of a common law relationship can have major consequences for property, support and parenting rights. It is also usually a very stressful and emotionally draining experience. Under these circumstances it can be difficult to make sound long-term decisions, particularly where complicated legal issues may be involved. Given the stakes, it only makes sense to contact a lawyer early in the process. A lawyer can help you navigate a short-term crisis while protecting your legal rights and helping you lay the groundwork for a new life. The family law group at Davidson Fraese has broad experience navigating the end of common law relationships. We work towards resolving conflicts so that you can start your new life. If you’re going through a common-law breakup, contact us for a free consultation. Our guidance can help you move forward, faster, while ensuring your legal rights are protected. Before you hire a lawyer, make sure it’s a good fit. That’s why we offer free consultations, on common law separations or any family law issue. To schedule a free consultation, call our Vancouver office at (604) 670-5626 or contact us through this website.